Representative Honours: Ireland: 2 Amateur Caps (1934). * Division Three (South) Cup; # War-Time appearances. 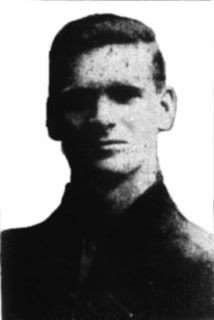 Ben Clarke was a right-back "admired for his sterling qualities and solid worth in the [...] rear division". Plucked from relative footballing obscurity with Dungannon, Clarke was put straight into Irish League football by Portadown, a risky move, "but his capabilities had been carefully weighed up, and he never for a moment threatened to let the side down... Clarke rose to the occasion in the manner of a born exponent." "Full of grit and intelligent in football matters... he kicks with freedom, his positioning is good [and] his clearances are a pleasing feature." It was such qualities that brought early talk of a move to a cross-Channel club, but before that could happen Clarke was twice capped as an amateur international. Eventually he move to Sheffield United, though his career was eventually cut-short by the outbreak of the Second World War. Clarke's son Godfrey played for Glenavon and his grandson Darren won golf's Open Championship in 2011 as well as many other golfing accolades. Ben was a gentleman. It was a pleasure to know him. When I was a student I travelled with him to Moy Park in Moira everyday over a summer holiday. He was the grandfather of Darren Clarke, top folfer and Open Cahmpion in 2011.